We live in unprecedented times – the number of displaced people has reached extraordinary proportions, as more and more people are forced to flee their homes. Poverty, environmental degradation, persecution, war and conflict are not only the source of mass displacement, but also the source of impoverishment and impairment. And yet, rarely visible, seldom heard, disabled forced migrants are persistently recast in an epistemological and ontological shadow. 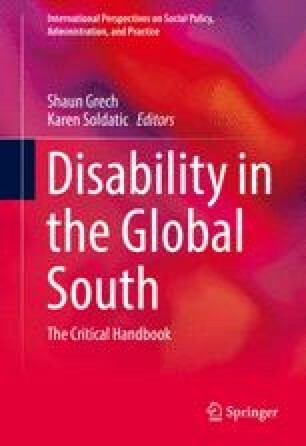 This chapter explores the disability/forced migration nexus in an attempt to understand some of the critical intersectionalities that emerge, and their implications for theory and practice. We argue that forced migration studies, as well as humanitarian responses, maintain an ableist approach focusing on heteronormative productive bodies, whilst disability studies continues to pursue social justice and access to rights within a corpus of knowledge framed within the hegemony of sovereign structures and liberal democratic norms, thus excluding the non-citizen disabled body.Engaging a critical approach, in this chapter we frame the study of disability and forced migration within broader global political, economic and social structures and processes, that seeks to locate the multidimensional individual within macro structures and processes, whilst acknowledging how the agency of the subaltern disabled forced migrant located in the global South persistently confronts, challenges and negotiates such global structures. Aleinikoff, T. (2015, February 25). From dependence to self-reliance: Changing the paradigm in protracted refugee situations. Retrieved March 11, 2015, from UNHCR Global Views: http://blog.unhcr.org/globalviews/changing-the-paradigm-in-protracted-refugee-situations/. Aljazeera. (2015, October 29). Amnesty: Australian officials paid people smugglers. Aljazeera. Retrieved December 8, 2015, from http://www.aljazeera.com/news/2015/10/amnesty-australian-officials-paid-people-smugglers-151028230421588.htm. Buscher, D. (2014, February). Preventing gender-based violence: Getting it right. Retrieved September 13, 2014, from Humanitarian Practice Network: http://www.odihpn.org/humanitarian-exchange-magazine/issue-60/preventing-gender-based-violence-getting-it-right. Council of Europe. (2010, February 4). Commissioner for human rights: Criminalisation of migration in Europe: Human rights implications. Retrieved October 18, 2014, from Council of Europe: https://wcd.coe.int/ViewDoc.jsp?id=1579605#P99_13092. European Commission. (2015, September 23). Managing the refugee crisis: Immediate operational, budgetary and legal measures under the European Agenda on Migration. European Commission. Retrieved October 24, 2015, from http://europa.eu/rapid/press-release_IP-15-5700_en.htm. Forced Migration Review. (2010). Disability and displacement special issue. Forced Migration Review, 35. Retrieved from http://www.fmreview.org/disability/access. Guterres, A. (2015, February 26). Open briefing on the humanitarian situation in Syria. Retrieved March 9, 2015, from UNHCR: http://www.unhcr.org/54ef66796.html. IASFM. (2014). About us. Retrieved August 8, 2014, from International Association for the Study of Forced Migration: http://iasfm.org/about/. UNHCR. (2015, January 7). UNHCR report shows world’s poorest countries host most refugees. Retrieved March 11, 2015, from http://www.unhcr-centraleurope.org/en/news/2015/unhcr-report-shows-worlds-poorest-countries-host-most-refugees.html.